La Foresta Nature Resort offers an exceptional restaurant and lounge at Los Senderos; offering a wide array of cuisine and cocktails. Naturally, we offer foods that are specific to the region, and incorporate many spices that are grown on our grounds or from neighboring farms. Situated at the edge of the rainforest, Los Senderos Restaurant was designed so that guests can view wildlife while dining from the new observation deck. From the deck, it is possible to observe many species of birds, monkeys and reptiles, including a caiman that inhabits the nearby creek. 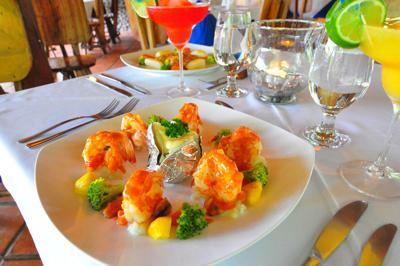 The restaurant is open for breakfast, lunch and dinner daily, and offers a great selection of hot and cold appetizers, perfect after a day exploring the wonders of Costa Rica. The bar features two large LCD televisions and a daily happy hour from 3pm-6pm. Very nice food looks very delicious,i want to visit this restaurant to eat it. Naturally, you are offering foods that are specific to the region, and incorporate many spices that are grown on our grounds or from neighboring farms. It is quite good practice to offer healthy food such like this. You can also include it with your web design . Just imagine after that it will be looks like groom. I have read the post, you have mentioned about La Foresta Nature Resort which is a great place to visit. 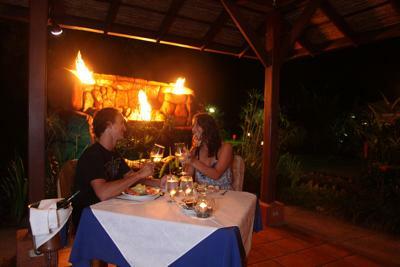 The resort offers different cuisine and cocktails which are delicious. I wish to go there some day. Join in and write your own page! It's easy to do. How? 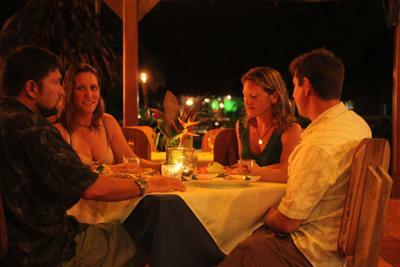 Simply click here to return to Quepos And Manuel Antonio Restaurants.